Designed especially to be a Vegan alternative to our Leather Bolo, our exclusive Cotton Bolo is soft with amazing feel, and has unmatched strength and durability. Indistinguishable from real leather, it is a fabulous alternative to leather at a very affordable price. Our Cotton Bolo uses vegetable based dyes and is finished for an amazing look and feel. Colorfast. Safe and certified for use in children’s jewelry worldwide, no other product anywhere has the look and feel of real leather and is 100% animal product free. 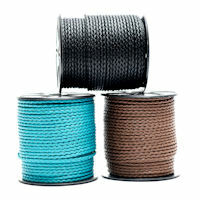 Available in a variety of colors and color combinations in 2.0mm, 3.0mm and 4.0mm diameters in 2 meter packs, 10 meter spools or 50 meter spools. Custom colors and color combinations are available upon request.